Like all Easter markets, the one on the Freyung can’t easily compete with the Christmas market on the same spot, but it does have one major advantage. When I say eggs, I mean there are lots of them. More eggs than an omelette factory. Eggs in a myriad of colours and designs, ready to hang on your Easter tree. 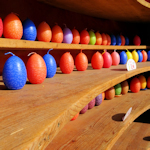 The centre of this small market is traditionally dominated by the “Ostereistand”, with box after box of painted eggshells and egg-shaped decorations. You can even buy ostrich eggshells to decorate at home. It’s worth taking a few moments to browse the displays, as some of the egg designs are quite beautiful: painted scenes; Easter, imperial, floral, and animal motifs; lacework decor; eggs as globes etc. etc. This centrepiece – together with a giant painted egg – ensures the market has a genuine Easter feeling to it. This is helped by the workshop/stage area, where, for example, kids can decorate their own polystyrene eggs. These Easter-themed displays balance the more generic arts and crafts flavour in the rest of the market (though you’ll still discover egg-shaped candles, Lebkuchen rabbits and similar). The craft stands are high quality, featuring the usual painted wooden shop signs, crockery, jewellery, clothes, leather items and more. And no seasonal market in Vienna is complete without food and drink. This is a chance to stock up on specialties, like mustards, vinegars, oils and honey (try Schönbrunn market for greater variety, though). I’ll admit to being very partial to the sharp Bergkäse alpine cheese they always seem to sell here. Be sure to cross the road to the adjoining organic farmer’s market, too. Youthful acolytes and wizened old mountain folk serve up a delicious cornucopia of organic fare: pickles and pastries, pate and cheese, sausages and salami, breads and beers. It’s a good spot to stop for a snack and, particularly, a glass of organic Austrian wine. The market is very central, about a five-minute walk from a major station (“Schottentor”), and not far from the cathedral and main tourist trail. So you might come across it on your travels anyway. Subway: Take the U2 to Schottentor (go south down Schottengasse) or the U3 to Herrengasse (go north up Herrengasse). Tram: The lines 1, D, 37, 38, 40, 41, 42, 43, 44 and 71 all stop at Schottentor. Bus: Take the 1A bus to Teinfaltstrasse (the stop is practically in the middle of the market).